An added-time goal by David Clifford saw Kerry grab a dramatic draw with Monaghan in an absorbing game in Clones. Kerry trailed throughout the game and were on the brink of a second straight defeat that would have ended their hopes of progressing to the last four, but Clifford’s late intervention kept them in it and stopped Monaghan from joining Galway in qualifying with a round to spare. 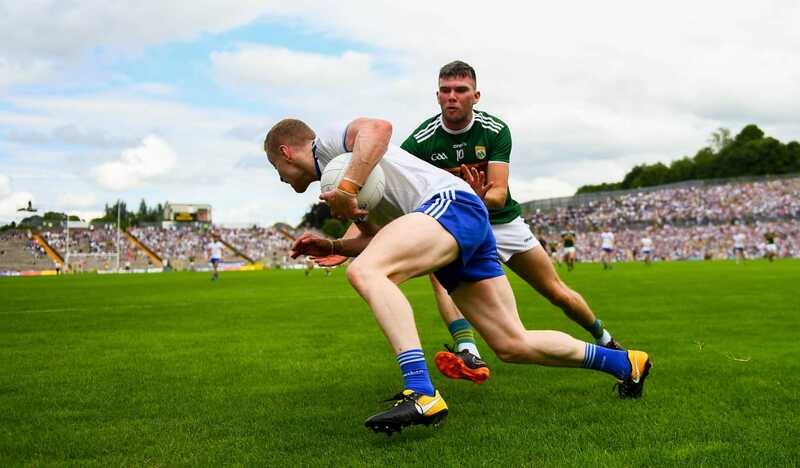 Monaghan had led by five points with almost an hour gone as they moved onto the brink of a first SFC win over Kerry, but the Kingdom came back to take a share of the spoils. Monaghan made a dream start with Conor McManus kicking 1-1 from play inside the first five minutes, the goal a tidy low finish underneath Brian Kelly, who replaced Kerry captain Shane Murphy between the posts. A brace of Seán O’Shea frees got Kerry on the scoreboard and although Rory Beggan responded with a huge free, O’Shea then clipped over a point from play. McManus and Niall Kearns extended Monaghan’s lead to four, but O’Shea and Tom O’Sullivan kept Kerry in touch. Darren Hughes and McManus added fine points for Monaghan, with O’Shea’s free-taking continuing to keep Kerry’s tally rising. David Clifford opened his account with a well-taken score, but McManus, Shane Carey and Beggan had the hosts five clear deep into added time. Clifford’s second point left Kerry trailing by four (1-11 to 0-10) at half-time and ten minutes after the restart, they had cut that deficit to the minimum via scores from O’Shea, O’Sullivan and David Moran. A McManus brace and another Beggan free saw Monaghan regain the initiative and even after Paul Murphy got one back for the visitors, McManus and Karl O’Connell opened up a five-point gap approaching the hour mark. Kerry hit back through Clifford and a Stephen O’Brien free, but a McManus free had Monaghan four to the good once more. Kerry sub Anthony Maher sent over a point and there was time for late drama as a long ball from sub James O’Donoghue broke kindly for Clifford to bury the equalising goal. Kerry remain in with a chance of progressing from Group 1 ahead of their home game against Kildare on August 4, while Monaghan will travel to table-toppers Galway. Scorers for Monaghan: Conor McManus 1-9 (5fs), Rory Beggan 0-4 (4fs), Shane Carey 0-1, Darren Hughes 0-1, Niall Kearns 0-1, Karl O’Connell 0-1. Scorers for Kerry: Seán O’Shea 0-8 (6fs, 1 ’45), David Clifford 1-3, Tom O’Sullivan 0-2, Stephen O’Brien 0-1f (f) David Moran 0-1, Anthony Maher 0-1, Paul Murphy 0-1. MONAGHAN: Rory Beggan; Ryan Wylie, Vincent Corey, Kieran Duffy; Karl O’Connell, Drew Wylie, Colin Walshe (Capt. ); Darren Hughes, Niall Kearns; Fintan Kelly, Dermot Malone, Ryan McAnespie; Conor McCarthy, Conor McManus, Shane Carey. Subs: Kieran Hughes for McCarthy (43), Owen Duffy for Carey (61), Dessie Mone for Kelly (66). KERRY: Brian Kelly; Ronan Shanahan, Mark Griffin, Tom O’Sullivan; Paul Murphy, Peter Crowley, Gavin White; David Moran, Jack Barry; Kevin McCarthy, Seán O’Shea, Stephen O’Brien; David Clifford, Kieran Donaghy, Paul Geaney. Subs: Micheál Burns for McCarthy (H-T), James O’Donoghue for Geaney (48), Brian Ó Beaglaoich for Griffin (50), Darran O’Sullivan for O’Shea (54), Anthony Maher for Barry (63), Paul Geaney for T O’Sullivan (70 + 1).